Fox Hall was built in the latter part of the 17th century by Edward Tyldesley 1635-1685. His son, Thomas Tyldesley 1657-1714, is frequently to be found living there during the period for which his diary survives. The location at Blackpool—then largely a deserted coastline—has inevitably led to speculation that it was chosen to allow the Tyldesleys to practise their religion and pursue their political interests away from the public gaze. The peaty coloured pool, which gives name to the place, is at the south end of Blackpool, near the house called Fox Hall, once a sequestered residence of the gallant family of the Tyldesley but now a farm house. This house is not so old as has been generally supposed. It was erected by Edward Tyldesley of Morley (the son of Sir Thomas Tyldesley, slain at Wigan, Lancashire, in 1651) in the time of Charles II. It was originally a small three-gabled building, with a small tower at one side of it. The walls were made of sea-shore cobble stones, and were of great thickness. Over the main entrance was engraved " Seris factura nepotibus," a motto which Edward Tyldesley expected would be his own, as his name was down on the list of " Knights of the Royal Oak," which Charles II at one time proposed to create as a means of rewarding the faithful supporters of the Stuarts. Over the south gateway was inserted a stone on which was chiselled a pelican feeding her young, round which was inscribed “Tantum valet amor regiae et patriae." Inside the hall was a priest's hiding place, long known as the "king's cupboard," tradition saying that it was erected for King James (who, however, never came there) during the plots of 1690 and 1694. 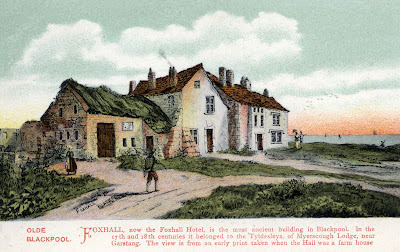 During the rebellion of 1715 Fox Hall was a private rendezvous for Popish recusants. After its sale by the Tyldesleys in the early 18th century Fox Hall was used as a farm house, a hotel and a pub. Until the late 1980s some parts of the property survived. However, permission was granted for clearance of the site and the erection of this hideous building, which was completed in 1991. All traces of the oldest habitation in Blackpool were thus lost. 4. The History of the Parish of Bispham in the County of Lancaster, Henry Fishwick, 1887.